While a thermometer is hardly the most exciting piece of device, it’s one that is quite essential to our lives. They are commonly used to take temperatures - and in the field of HVAC, temperature control is all-important. As little as 1°F could represent a huge change in equipment status and compliance with regulations, such as the proper temperature that a supermarket must store meat. Precision is important. Accurate temperature measurements are essential for tasks such as reading air differences, superheat, and sub cooling. 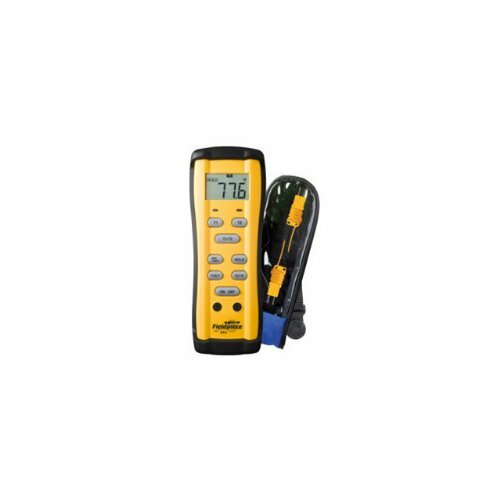 HVAC thermometers are most commonly used to measure air, water, refrigerant, and copper lines’ temperatures, and these measurements are vital to locating the source of potential hazard or defect. This pocket digital thermometer was designed with portability as the main focus and is intended for food monitoring, refrigeration, and light HVAC work. Some of the hardware functions of this gadget include a large display, auto-power off, folding probes, and a built-in magnetic mount. This highly portable digital thermometer is affordable and convenient, and we found the gadget most useful for cooking or doing light household maintenance, as this improved portability does come with some trade-offs: The lack of calibration, slow and occasionally inaccurate reading that takes anywhere from 5 to 10 minutes, and its subpar build quality. All things considered, the portability of this device makes it a great on the go equipment. The biggest feature of this handy little digital thermometer is its ability to simultaneously measure two different temperatures using k-type sensors. The device also provides T1-T2 readings on LED screen for enhanced accessibility and comes with a front face calibration pot and a magnetic hanger. What really makes this device great is that it not only allows you to use any k-type sensors but also lets you calibrate each of the thermocouples separately. This gadget provides accurate readings and is easy to use, and we recommend it to HVAC technicians. However, this device can be a little bulky to carry around and its tight plug-in area can be cumbersome. Also, this device does not come with a backlight, so if you plan on working in a dark place, we suggest packing a separate light source. This foldable digital thermometer is specifically designed to measure air temperatures in air ducts and provides useful features such as Celsius to Fahrenheit conversion, Min/Max/Hold functions, T1&T2 readings, a hanging hook, and an auto power-off function to conserve battery life. The gadget is meant for professional HVAC technicians and provides a fast and reliable reading. The thermometer is rugged, easy-to-use device that is highly portable, accurate, and affordable. Infrared thermometers have been on the rise for quite a while now, as many people are attracted to the concept of a non-contact thermometer and its potentials. We tried out a handful of infrared thermometers and compiled a list out of our favorites devices. 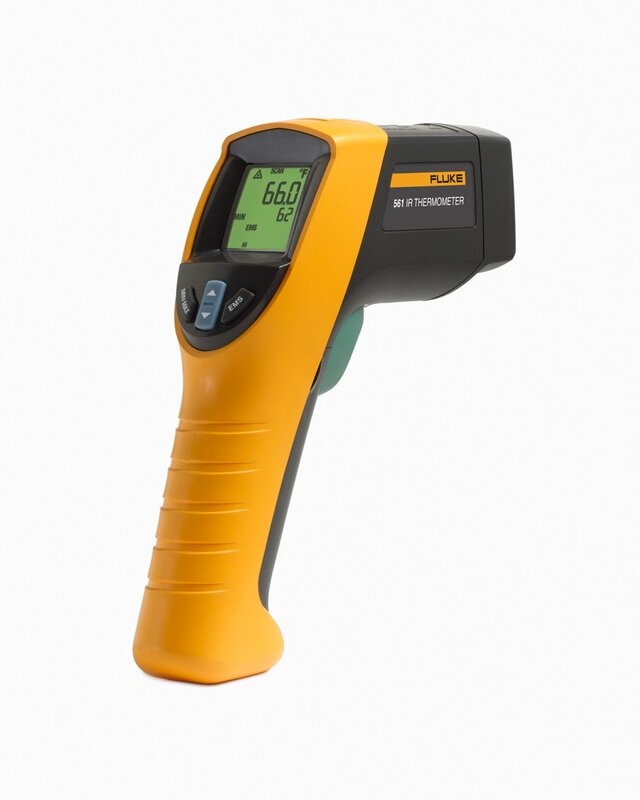 This infrared thermometer allows the user to take temperatures without having to directly contact the target. This device features laser pointers for improved accuracy along with an auto-off function to preserve battery. Other hardware features of this gadget include Celsius to Fahrenheit conversion, unit conversion, data hold, and an LCD backlight. 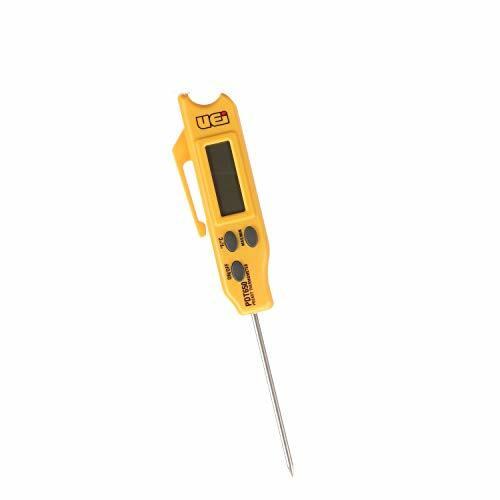 This thermometer is designed with portability and user-friendliness in mind and is recommended for home maintenance work, auto maintenance work, cooking barbecues, and measuring the temperature of inanimate objects. The best part of this thermometer is its versatility – the device is known for its functionality, especially when it comes to home repairs and household use. The device is exceptionally easy to use and generally provide accurate readings. 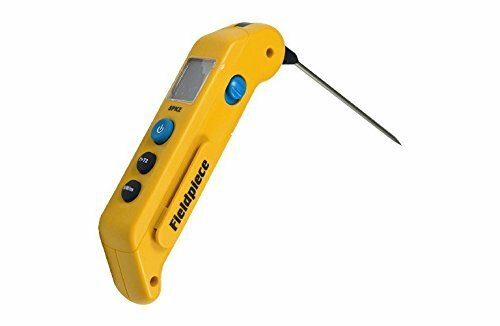 The affordability of this gadget makes it a great deal for home mechanics, as this thermometer provides excellent value for its price point and is rugged enough to withstand rough terrains. 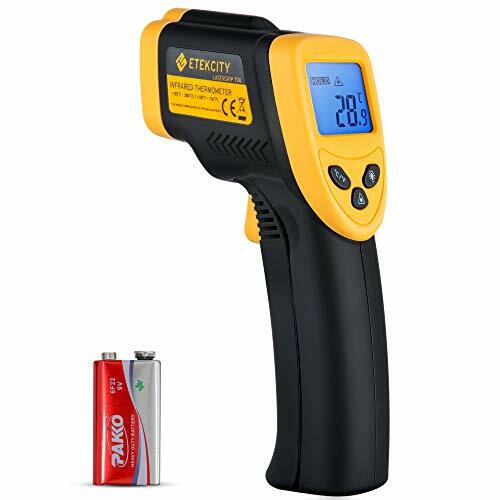 Do keep in mind that as this gadget is an infrared thermometer, and it does bounce off reflective surfaces such as fluids and stainless steel. This phenomenon could be fixed by applying electrical tape on the surface of such materials. Also, although we have yet to experience such problems, some have reported having received defective units with questionable build quality. 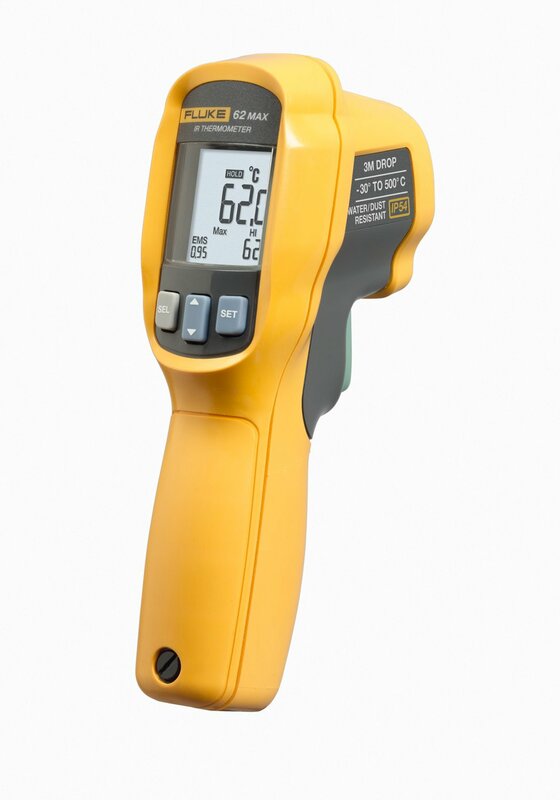 This infrared thermometer is designed to ensure the safety of HVAC technicians required to take temperatures in hazardous locations. The designated purpose of this device is monitoring electrical, mechanical, and automotive systems, but it performs extremely well regarding household maintenance and monitoring food temperature as well. Some of the features of this device include Celsius to Fahrenheit conversion, Min/Max/Avg./T1&T2, dust and water resistance, and laser sighting for pinpointing measurement area. This device is highly functional with its wide temperature range and provides great overall value for its price point. It’s a gadget for both the home mechanic and HVAC technician alike, and provides solid, reliable readings. However, we found the user manual slightly hard to understand, as there are no texts but just diagrams, and while this is not a major flaw by any means, it could get a little frustrating when you are trying to figure out your new thermometer. The Temperature Gun is designed with HVAC technicians in mind and complies with FDA and FCC regulations. It features two laser pointers for easy targeting and includes functions such as Celsius to Fahrenheit conversion, Min/Max/Avg. display, adjustable emissivity, and a rugged design for increased durability. This thermometer is very easy to use with its simple operations and calibrations and provides fast and accurate readings. However, the device is not immune to faulty readings, and will sometimes give back inaccurate results. The manufacturer is also known for their great customer service, and customers who received a defective unit have been able to trade in their defective device for a functioning one. 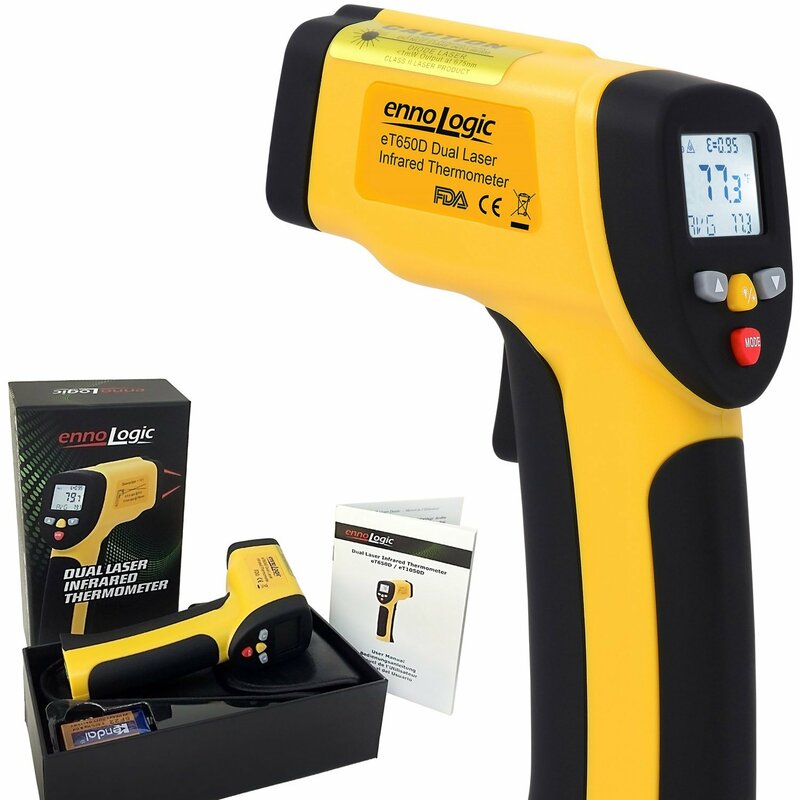 As the name states, this infrared thermometer is specifically designed to serve HVAC professionals. It boasts accurate calibration and comes with an NIST calibration certificate. The gadget also includes type k thermocouple that allows the user to take both contact and non-contact temperatures. This ability to take contact temperature as well as non-contact temperature is the biggest appeal of this gadget, as it eliminates the necessity to pack a contact thermometer. This device provides highly accurate and reliable readings and has a Celsius to Fahrenheit conversion switch, but the switch can be hard to find, as it is located inside the battery compartment. A quality thermometer may not change your perception of the world, but they are quite useful when it comes to home and automotive maintenance, HVAC work, and equipment repairs. An accurate, speedy thermometer is an absolute must for HVAC technicians, but even if you are not a professional, there are plenty of reasons for needing a quality thermometer. While it holds true that high-quality devices are more expensive, they are so for a good reason – for one, if your thermometer were inaccurate or non-functional, you would have to spend more money and time to replace your current thermometer. High-quality thermometers are not only able to deliver reliable results, but also a lot more rugged and faster compared to lesser devices, which contributes to an increase in productivity. Also, ruggedness is a valid concern when it comes to HVAC equipment, and low-quality gadgets are prone to have inferior build-quality. Such devices may be fine for occasional use, but might not be able to withstand frequent usage. This brings us back to why we recommend the more expensive, high-quality thermometers, as quality devices reduce such concerns and turn out to be less expensive in the long run. Of course, the features that define the best thermometer really depends on the situation: If you are working with copper lines, you might want to get a digital thermometer with a probe instead of an infrared thermometer, as infrared thermometers tend to bounce off reflective surfaces, and may return inaccurate readings. The general consensus when it comes to electronics is that the more innovative a product is, the better it is, but that’s not always true. The best thermometer for you should have the features you need and use, so a careful comparison is a must before you invest your hard earned money in a quality thermometer. When purchasing a digital thermometer, you should also consider factors such as accuracy, calibration, probes, Celsius to Fahrenheit conversion, and portability. If you are looking to get an infrared thermometer, some features to consider include the device’s range, accuracy, distance-to-spot ratio, and device-specific features such as response time and emissivity. Thermometers are nothing but tools in the end, but as Thomas Carlyle said, “Man is a tool-using Animal. Nowhere do you find him without tools; without tools he is nothing, with tools he is all”. This quote resonates with our beliefs, as we believe one’s quality of life could be bettered by the quality of one’s tools. A good thermometer may come with a higher upfront cost, but it will deliver better result and save you time and money in the end. We strive to provide the best information about such tools, which is why we tried out a lot of thermometers and picked out our favorites, in hopes of assisting people interested in purchasing a digital thermometer so that the necessary information could be accessed with the least legwork.